With VW Kombis fetching classic Porsche or Ferrari money these days, Nick Parker-Davies’ Kombi Shop is a true dream factory. Tucked away behind the main road between the Sunshine Coast tourist towns of Noosa and Eumundi is a VW Kombi dream factory. The Kombi Shop is the largest classic Volkswagen restoration business in the Southern Hemisphere, and a place where owners from across Australia send their iconic VWs for better-than-new transformations. On arrival I’m greeted by a range of classic Kombis, Beetles, buggies and other air-cooled classics resting in the sunshine. Some are basket cases, others look ripe for freshening up and a few are in the early stages of being brought back to life. There are three sheds where I hear panel bashing and air guns firing; this is a buzzing, busy place and everyone at work greets me with a smile and a quick chat. It’s hard not to smile when you see a Kombi – it’s obviously the same when you work on them. Nick bought an old split-screen Kombi wreck for about $200 (this was 1992), fixed it up and tried to find a camping interior. “I couldn’t believe there was nothing available; I just couldn’t buy a Kombi interior,” he said. So Nick designed the interior he wanted, had a cabinetmaker build it and give him the templates, and his Kombi promptly won one of the UK’s largest car shows. Sniffing the business potential, he printed up business cards, went to another show and took nearly 20 orders from VW owners. 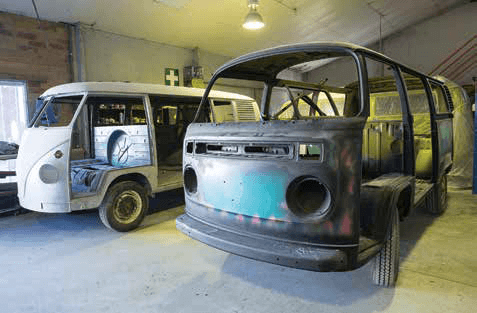 He founded Bus Guts to cover Kombi bespoke interior work, and owners were soon asking for mechanical and paintwork as well. After moving to the Sunshine Coast in 2005 Nick continued doing what he knew and loved, establishing the Kombi Shop in a single shed just outside Noosa. Today the vast majority of work is still on the lovable buses, but a few other classic air-cooled VWs pass through as well. Nick said. That means the workers – all permanent, no casuals – are divided into set areas such as fabrication for rust and panel work, body shop for the body work and paint, and the mechanical side for engine building, gearboxes and actually screwing everything back together. Little wonder the 12 or so turnkey Kombis that leave this shop each year command six-figure sums for their full restos, but Nick’s shop is busy for a reason. There’s demand here, and it’s a vehicle to cherish.